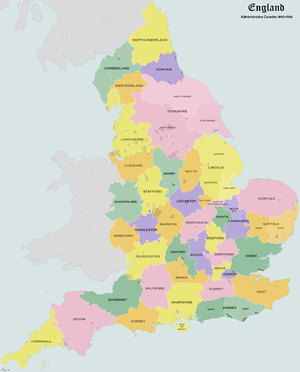 An administrative county was an administrative division in England and Wales and Ireland from 1888 to 1974, used for the purposes of local government. They are now abolished, although in Northern Ireland their former areas are used as the basis for lieutenancy. England – administrative counties 1890–1965. Dún Laoghaire–Rathdown, Fingal and South Dublin (County Dublin). Created in 1994.